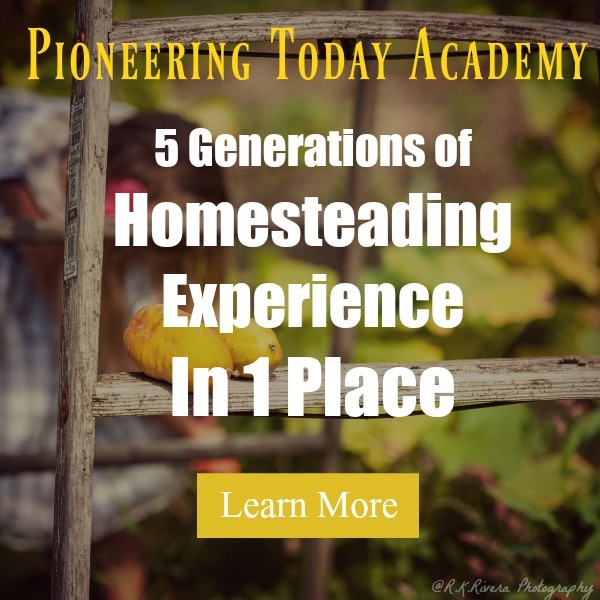 We’re sharing tips and methods that the pioneers used to be more self-sufficient and to save money going into the leaner months on this episode #115 of the Pioneering Today Podcast. The pioneers were probably the busiest in fall, bringing in the harvest and preserving it for the leaner winter months. Stocking up the larder wasn’t just important to help keep the grocery bill lower (many of us who grow our own food know how much less we spend when the fresh produce is on) but a matter of true survival. And not just for themselves, but also for their livestock. They couldn’t just go to the feed store and purchase feed. Choose the quickest and most versatile form of preservation or use of the food. Example: I dehydrate all of my herbs. Once the herb or spice is dehydrated I can create everything else from it.The most versatile and quickest form of preservation with my winter squash is in it’s whole form. I can then roast it, cook it up for puree and pies, bake it whole, dehydrate it later or can it later.You can catch our full podcast episode #70 10 tips for storing vegetables without a root cellar for long-term storage, but two quick tips from that is to leave the stem on your pumpkins (this is true for any fruit as well), butternut, acorn, any of your squashes, this prevents oxygen from getting in as fast and breaking it down.Also, wipe down the outside of the whole squash with straight vinegar (be sure to dry it) to remove any bacteria that would increase the rate of rot. 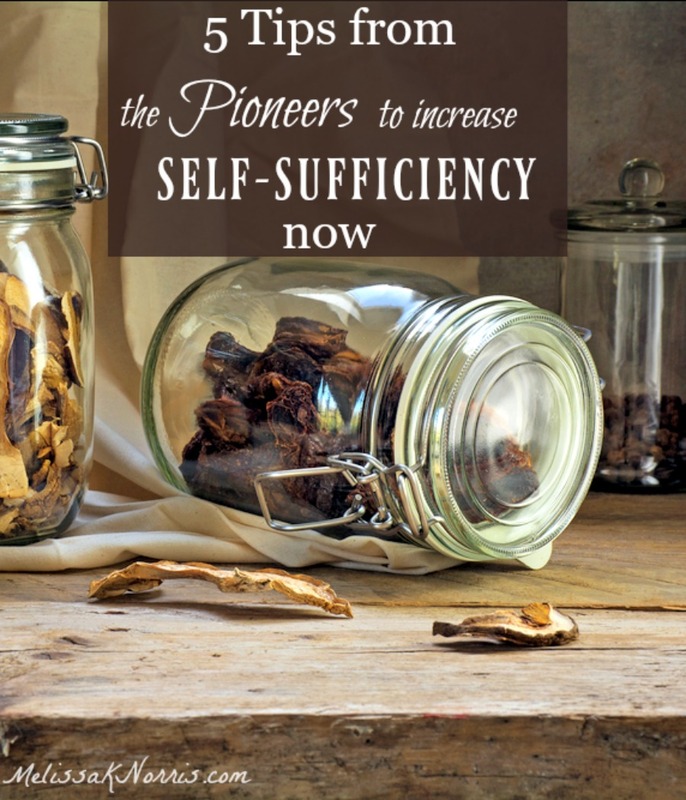 Learn how to create many of your own products from what you preserved or harvested. The pioneers of old didn’t run to the store to stock the medicine cabinet. They used their herbs for cooking and for medicinal purposes.Disclaimer: I’m not a professional medical. 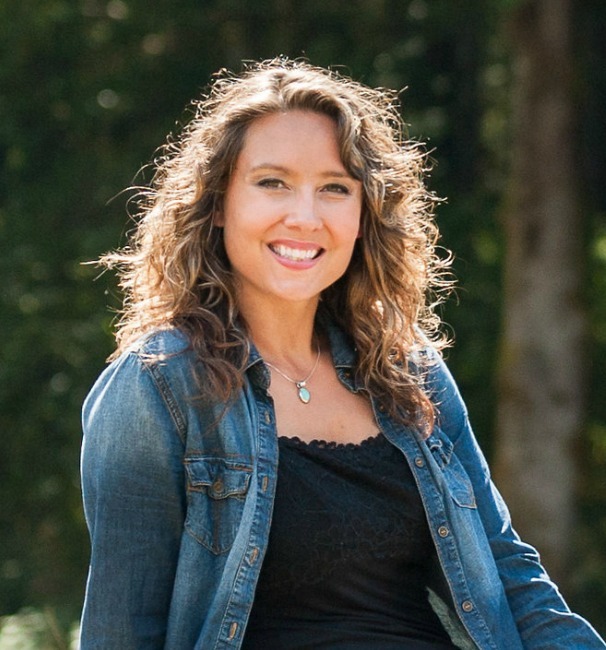 I’m not a certified herbalist or anything like that, but I do believe in learning and researching and using some traditional, natural remedies and herbs in your natural medicine cabinet alongside with our modern medicine. Stock your medicine cabinet with herbs to create your own remedies. The homes of old used their own herbs and spice cabinets to create natural remedies. They made their own medicinal teas, tinctures, herbal infused oils for salves, ointments, soaps and balms, and poultices just to name a few. 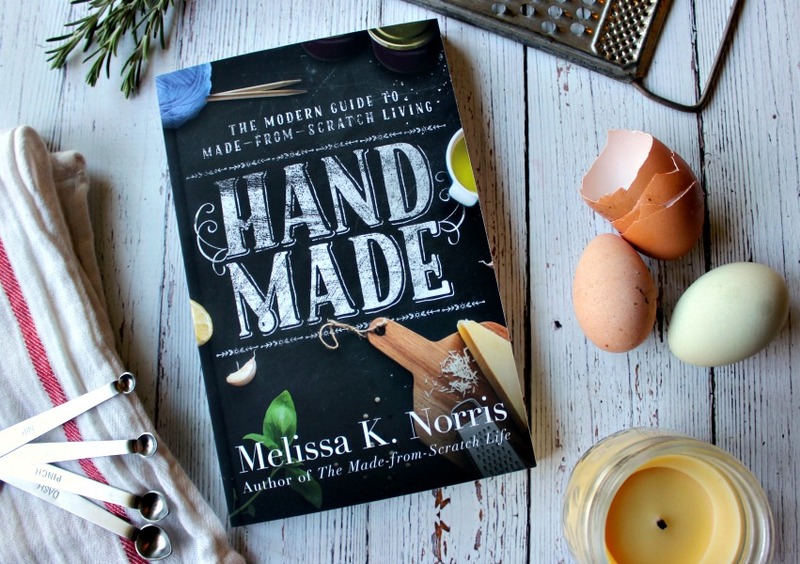 The homes of old new how to make their own products, instead of relying on the store, they could trust the ingredients and sourced a lot of it themselves. This knowledge has quickly been lost in just a few generations, but thankfully, there’s a handful of us who are making sure they’re not lost and teaching others how to do it. 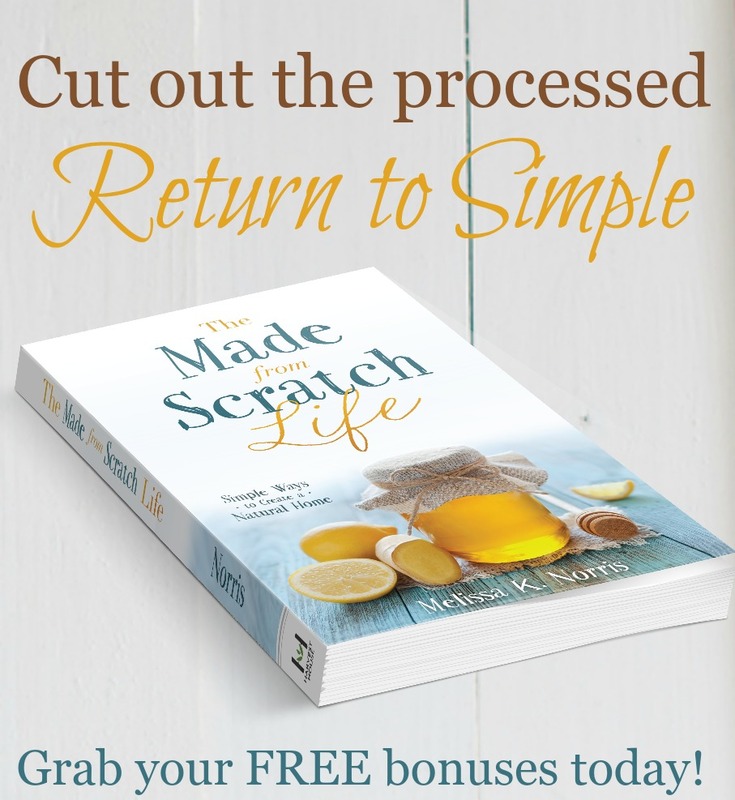 Make your own products at home and know exactly what ingredients are going into them. the Hand Made Masterclass shows you how. 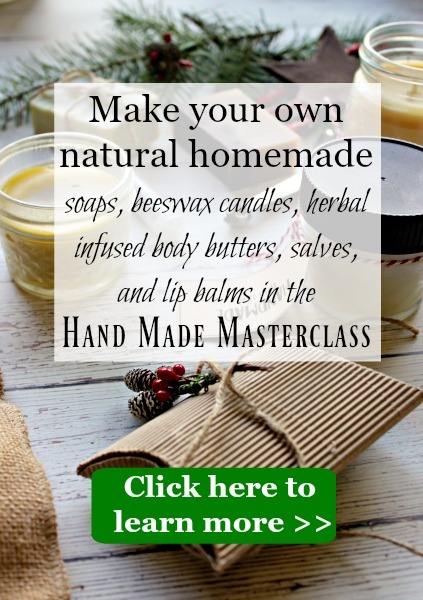 Create nourishing herbal infused soaps, lip balms (including color and homemade lipstick), chocolate peppermint body butter, beeswax candles in a Mason jar, and more! Click here to find out more. ***Harvesting while the animal is still on the gain. Typically, your livestock eats well throughout the summer months and weighs the most going into fall, which means a larger harvest for you. ***Not feeding during the winter months. This isn’t cost effective and when you’re providing the feed yourself, you want to make sure you won’t run short. ***turning the fat into light sources, soaps and more. Using all parts of the animal. The fall butcher time happened just in time to use the fat to make your candles for the rest of the year. With the shortening days, having light was important.Beef fat is called tallow and was generally used for soap and candle making. Pork fat is called lard and was used for cooking and baking, as well as soap and candle making, but the leaf lard (the purest) is more desired for cooking than tallow.I use our lard for making Beeswax candles in a jar (but also share how to do it with coconut oil) in both my new book Hand Made: the Modern Guide to Made-from-Scratch Living and also as one of the video lessons in the Hand Made MasterclassLearning how to make your own soaps and candles (even if you’re not harvesting the oils yourself) are important skill sets and knowledge to learn. Plus, it’s down right fun and much more cost effective to make them yourself. Bonus tip 6. Start planning out what items you’re going to be making and giving for Christmas. The pioneers began their gift giving plans in the fall (if not before) because they made their own gifts and used what they had on hand. Join our FREE 5 Day Handmade Christmas Challenge here to get a jump start and create your own customized gift giving plan.